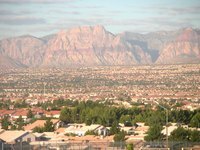 Las Vegas has a very dry climate and, according to the University of Nevada, Las Vegas, receives only about 3.5 inches of precipitation per year. With summer temperatures reaching 110 degrees or more, most people spend their time in air-conditioned homes or workplaces. Many indoor plants are not well-suited to the low humidity of Las Vegas. Fortunately, there are some indoor plants that grow very well in a dry environment and some have the added benefit of increasing the air quality in sealed buildings. Cactus and succulents have evolved specifically to thrive in lower humidity climates. They require little maintenance and are also one of the few plants that can handle full sun exposure every day. Aloe vera and the flowering kelanchoe (Kalanchoe blossfeldiana) make very attractive indoor plants. According to NASA research scientist B.C. Wolverton, in his book "How to Grow Fresh Air," aloe vera (Aloe barbadensis) has the added benefits of having medicinal qualities and being one of the few plants that increases oxygen in the air at night while absorbing carbon dioxide. The areca palm (Chrysalidocarpus lutescens) is a great choice for the Las Vegas area due to its ease of growth and benefits to the indoor environment. It helps to increase indoor humidity by releasing nearly a quart of water into the air each day. Considering the low humidity of Las Vegas, this palm can help create a more comfortable indoor environment. The areca palm is also an exceptional air purifier and helps to remove common indoor air toxins. Areca palm is fast growing and attractive. It prefers a semi-sun placement. Pothos are one of the easiest and versatile houseplants you can find. They grow quickly and resist insect infestations. Pothos tolerates low light levels and low humidity. They are commonly used in hanging pots but can also be trained to climb or be planted as undergrowth for an indoor tree. This plant is also easily propagated. Ferns can make some of the most beautiful indoor plants. Unfortunately, they can be difficult to grow, especially in low humidity. The Kimberley queen (Nephroleis obliterata), however, adapts to drier climates more easily than other ferns. Due to its high transpiration rate, it helps to increase indoor humidity. This plant will take a bit more care because the soil should remain moist and the leaves will need misting. The Kimberley queen prefers filtered sunlight. Although spider plants (Chlorophytum comosum) are commonly seen as indoor plants in the Southeast, they do very well in dry climates. Spider plants grow quickly and flower throughout the year. Additionally, they help to reduce indoor air pollutants. Mature spider plants produce many plantlets. These plantlets can be propagated and planted or left on the mother plant. The most common spider plants are variegated, but there are nonvariegated varieties as well. These plants prefer semi-sun.